Favorite activity: To do zoomies with my sisters. Special talents: I can sit so pretty and greet people like a lady. 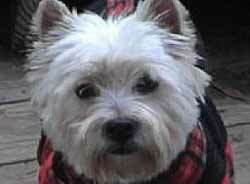 Most embarrassing moment: Westies never have embarrassing moments. Most trouble I ever got into: Trying to get my own food out of the fridge. Biggest adventure: Getting to go to my forever home from the puppy mill.